Fili, Norberte, accipe candidam vestem! Assumpta est Maria in caelum: gaudent Angeli, laudantes benedicunt Dominum. 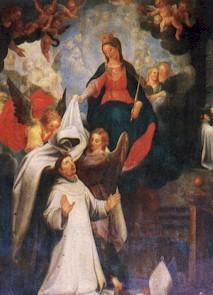 The Solemnity of the Assumption of Our Blessed Lady is an important feast in our Order. Under the title of her Assumption Our Lady is patron of our abbeys of Averbode, Tongerlo, Csorna, Leffe, Windberg, Daylesford, Strahov, Kinshasa, Villoria and Schlägl. So too does the whole Order invoke her as Queen of our Order on the feast of her Assumption. Spreading devotion to the Blessed Virgin is one of the hallmarks of our Order. It was she who gave to St. Norbert the white habit and Our Holy Father was most especially devoted to her Immaculate Conception. She is patron or co-patron of most of our houses and in our priory we enjoy her patronage under the title of ‘Our Lady of Sorrows’ (together with that of St. Philip Benitzi). Similarly Prémontré was dedicated to her. To this day in many of our houses an antiphon to the Blessed Virgin is sung after each office – a reminder of the tradition of reciting her ‘Little Office’ after the canonical hours. On this day let us then especially ask Our Blessed Lady, glorious in her Assumption, to intercede for our Order. Queen of our Order! pray for us! This entry was posted in General, O.Praem Pictures, St. Norbert. Bookmark the permalink.